This is the ultimate in overnight kayaking expeditions. Spend 6 days exploring the Whitsunday wilderness, with our friendly and informative guides. This is the ultimate overnight sea kayaking expedition. Spend 6 days sea kayaking, snorkelling and exploring the Whitsunday wilderness with our friendly and informative guides. Immerse yourself in the sparkling turquoise waters that lap the white silica sands of Whitehaven Beach. Marvel at the iconic views from Hill Inlet and enter an amazing underwater world of fringing coral reefs. Snorkelling, bush walking and camping out under the stars are all part of the experience you will never forget. Private group trips available throughout the year please call direct to discuss. Day 1: Our Courtesy bus picks up paddlers from their accommodation in Airlie Beach and transfers them to our base at nearby Shute Harbour. Kayakers, kayaks and supplies are then transported by fast water taxi to iconic Whitehaven Beach – on the south east of Whitsunday Island. Camp is set up and the rest of the day is spent exploring nearby Haselwood Island. The snorkeling here is simply brilliant with colourful fringing coral gardens and prolific marine life. Schools of electric blue damsels, delicate angel and exotic butterfly fish are amongst the fish that are regularly spotted here. After returning to camp, the group has the opportunity to take in a short bushwalk to the Chance Bay Lookout. Stunning views over the southern end of Whitsunday Island to the islands beyond is a great reward for the effort. As the afternoon comes to a close, sit on the beach and enjoy the tranquillity brought on by the setting of the sun. Day 2: The white silica sands of Whitehaven Beach form a perfect backdrop as the group paddles north – following the coastline –usually with the assistance of the following south-easterly trade winds. Kayakers stop off near the entrance of Hill Inlet for a swim and walk to the world renowned lookout with its breathtaking views. Green sea turtles and stingrays swim near the entrance to the lookout and can be spotted from the top. After a well earned break, paddlers continue north following the east coast to the Cairn Camp Site. Day 3: An early morning walk to the Cairn Lookout makes for breath taking views across Hook Island and Border Island. After breakfast, the next leg of the journey ends at the stunning Crayfish Beach on Hook Island. This is often described as the best campsite in the region, and is set against the backdrop of Mackeral Bay. The coral here is world-class and schools of fish can be spotted negotiating the maze of mangrove roots that line the inlet to the north of the campsite. Day 4: The group kayaks around the north-eastern tip of Hook Island (also called the Pinnacles) to the protected northern waters. After a snorkel at one of the many bays, the next stop is Maureen’s Cove where the groups set up for the night. Maureen’s Cove is a renowned snorkelling site with easy access from the coral beach. 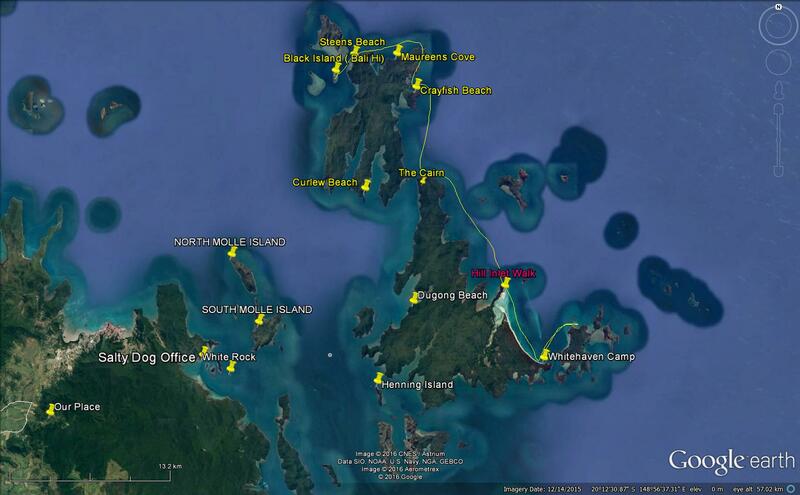 It boasts an array of underwater valleys and caves and abundant marine life including giant Maori Wrasse and Manta Rays. Day 5: A more leisurely day, with a relatively short paddle across Hook Island to Steen’s Beach, allowing plenty of opportunities to snorkel and relax. Discover the beautiful iridescent blues and greens of the clams that make the Whitsundays their home. This area has a good coverage of both hard and soft corals. Day 6: Paddlers pack up their gear one final time and head west towards Bali Hai a tiny picturesque island surrounded by colourful coral. This area attracts large parrot fish,and coral trout that can be spotted swimming throughout the coral gardens. The group then paddles towards the pristine Langford Island where there is an opportunity to snorkel with turtles. In the afternoon, the water taxi arrives and takes the group back to our base at Shute Harbour. NOTE: The exact route for the 6 day expeditions will depend on a number of factors such as weather, paddler’s ability, tides and barge availability and may change before or during the trip.